Montgomery Street was originally known as Halfway before being renamed in 1882 after the poet James Montgomery. 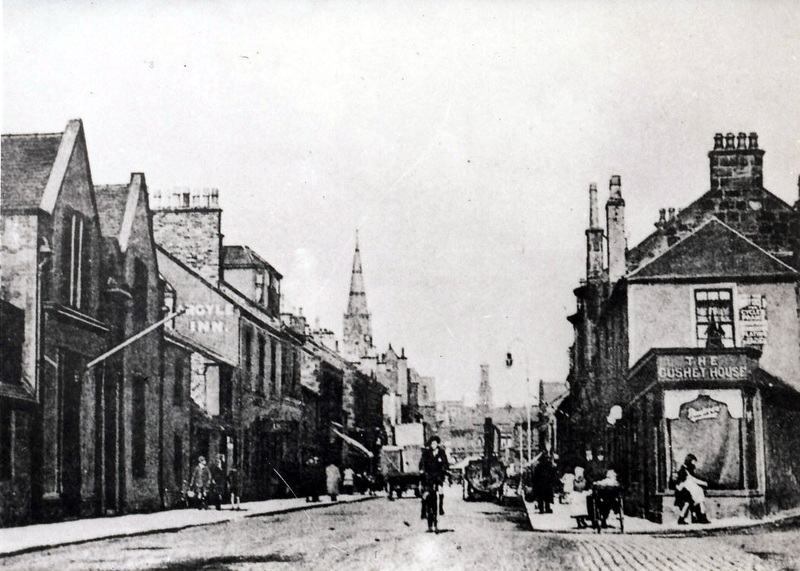 The area was originally part of the Parish of Dundonald, but in the 1890s become part of the Irvine District. The buildings in this photograph were demolished in the 1970s during the construction of the town’s Rivergate shopping centre. The industrial revolution saw the halfway part of town grow immensely population, thanks to the ease of access to the harbour scores of factories and ship yards opened in the area. At one point in the late 1800s almost half of the town’s total population (roughly 10,000) were tightly packed into the small space that was halfway. This view looking towards the town centre is taken from around the area the train station is located, all of the buildings that are visible, bar the Townhouse and Trinity Church which can be seen in the distance, were demolished in the 1970s to make way for the Shopping Centre, its car park and the new council offices at Friars Croft. The large machine sitting to the right hand side of the road is a tar boiler.